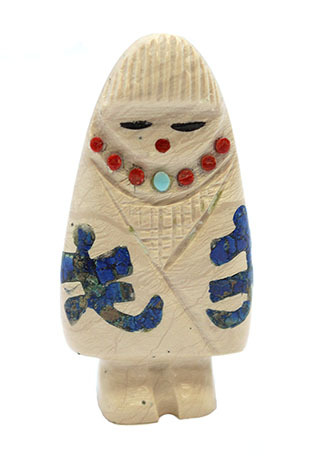 This maiden is carved out of fishrock and has coral and turquoise dots as the necklace and has azurite inlaid dragonflies on its outfit. It measures approximately 1 7/8" tall by just under 1" wide and about 5/8" thick. It is Zuni hand carved and inlaid by Cheryl Beyuka. Colors may vary and size may vary some also.